Hey guys! 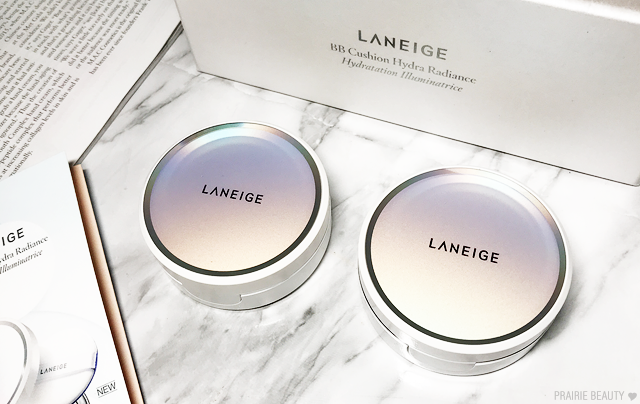 I'm super excited about today's review because not only is LANEIGE one of my absolute favorite K-beauty brands, but I've also been a long time fan of a Korean BB. Unlike more western BB creams that tend to really just be tinted moisturizers without any coverage, Korean BB creams have consistently ranked among some of my favorite coverage products. 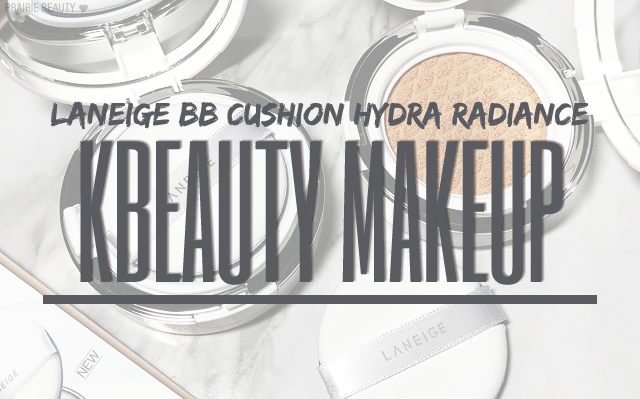 Based on all of that, it won't surprise anyone that I was super excited to try out the LANEIGE BB Cushion Hydra Radiance*. 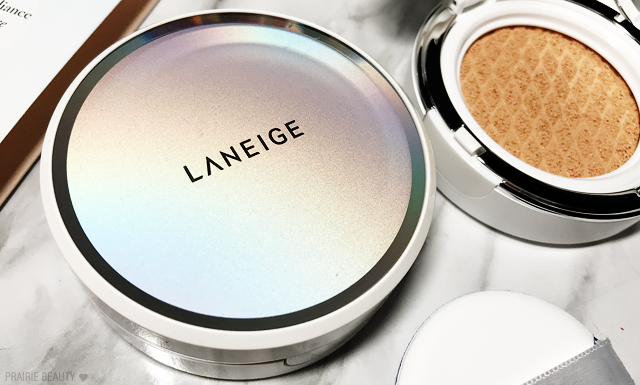 Though I never did get around to trying their original BB Cushion, it was always on my list, and I've honestly really enjoyed all of the products I've tried from LANEIGE thus far, so I had high hopes! I absolutely love the packaging of this cushion, both from an aesthetic and a functional perspective. The white packaging with silver accents and branding would have been really pretty on its own, but they also added a really subtle holo to the top that just give it that extra something. It's very sturdy and has a really high quality, good sized mirror in the compact, both of which make this a great product for tossing in your bag for touch ups throughout the day. The applicator pad that it comes with also feels really high quality, with a velvety foam surface that picks up product well and feels good on the skin. For me, the packaging really does tick all of the boxes. Though I do like the applicator pad and use it for touch ups, I prefer to apply this product with a blending sponge that has a flat surface. While this probably does use a little bit more product, I find it easier to hold in my hand which makes a full face application a lot more comfortable for me. When I apply it that way, I find application of this product really quick easy. It blends really seamlessly into the skin without really having to work with it - just bounce it on and it seems to blend itself. 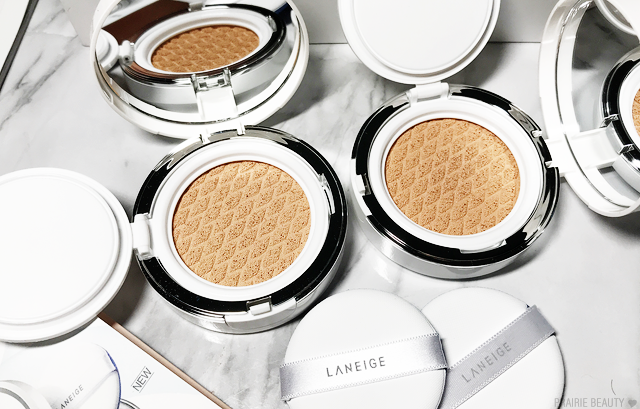 When it comes to coverage from a cushion, I feel like the most you're going to get is a medium. 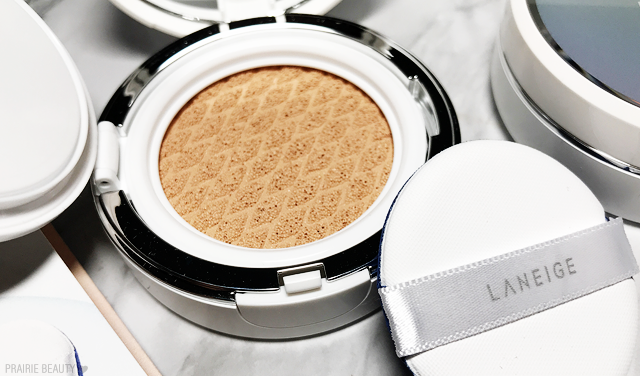 For me, if I'm reaching for a cushion it's because I want something with a lighter coverage and a more brightening effect on the skin, and this fits that perfectly. I'd say that this is a light to medium coverage, but easily buildable to a full medium. You can definitely still see skin through it, but it does a really solid job of evening out skin tone and covering minor imperfections. AS you can see in the photo below, this did give a much more evened out look to the skin while still looking like skin. 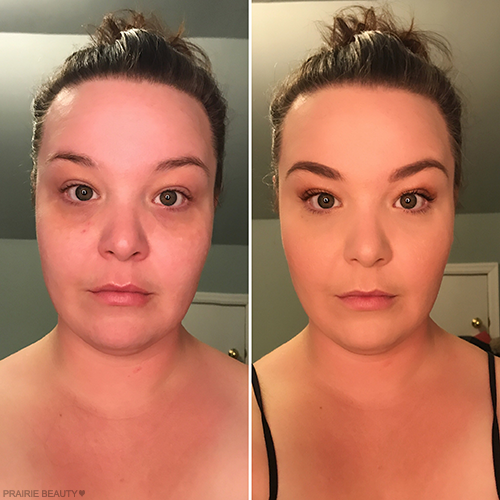 For my undereyes and a couple of blemishes in this photo, I did add a fairly high coverage concealer and I think they paired really well together to give me coverage where I needed it and a low maintenance, natural look on the rest of the skin. I think the thing that I love most about this cushion is the finish. It's definitely a luminous finish that makes my skin look really healthy, but I've never found it to get greasy looking or break up on me. I don't know how this would work on oilier skin, but on my normal skin type it worked really well and felt set with only a dusting of a lightweight, luminous finishing powder. I would say that the wear time on this is moderate and it definitely isn't a long wearing product. By the end of a work day without touch ups, I can definitely see where the product has faded and is providing less coverage than I started the day with. That said, I do find that I can easily touch it up if I have the compact in my purse and it layers well on top of itself. Overall, I really, really enjoy this product and have found myself reaching for it on lighter makeup days when I want my makeup to look natural and not be too fussy, but still give my skin a great look. I feel like this would be a seriously phenomenal option for dry or more mature skin because the finish really gives a healthy brightness to the skin without adding heaviness or oiliness and the coverage gives a naturally even look to the skin. I would skip this if you prefer something with a more full coverage or if you're looking for a matte, airbrushed type of look. This is definitely a more natural, luminous coverage product - exactly what I've been gravitating towards lately! 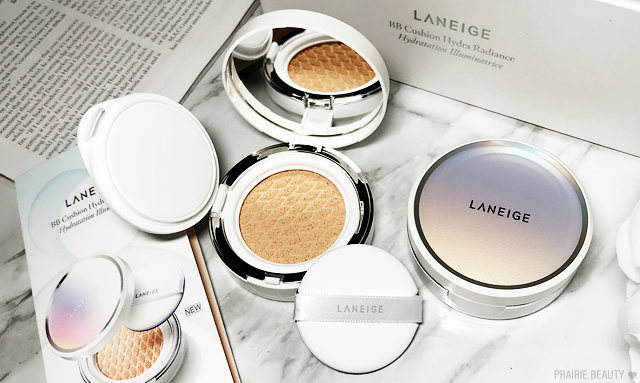 The LANIEGE BB Cushion Hydra Radiance* is available at Sephora Canada and retails for C$49.00. It includes 1 full compact and a replacement cushion.